Disclosure: I am a proud ambassador for The Little Potato Company and all opinions are my own. With fall and winter approaching (I know, I know – not quite there yet! But I am thinking ahead) I like to come up with recipes that are good “fix-it and forget-it” crock pot meals. I have a good number of slow cooker recipes on here that can simmer and hang out for most of the day without worry. But, I also have a few that are technically crockpot recipes but they really are not the set-it and forget-it kind. Most importantly, with kiddos back in school and Mom and Dad working and trying to help with homework, getting housework caught up and all of the other things that fill our days – I figured making dinner should be one less thing to worry about. This is one of those rib-sticking, all-in-one meals that gets better as it cooks. Best of all, the meat gets nice and tender the longer it cooks also. Plus, it’s affordable and makes enough for a family of 6. Almost all beef stew meat is very reasonable in price however the meat itself can be tough so cooking it slowly and on a low temperature really helps to tenderize the meat. 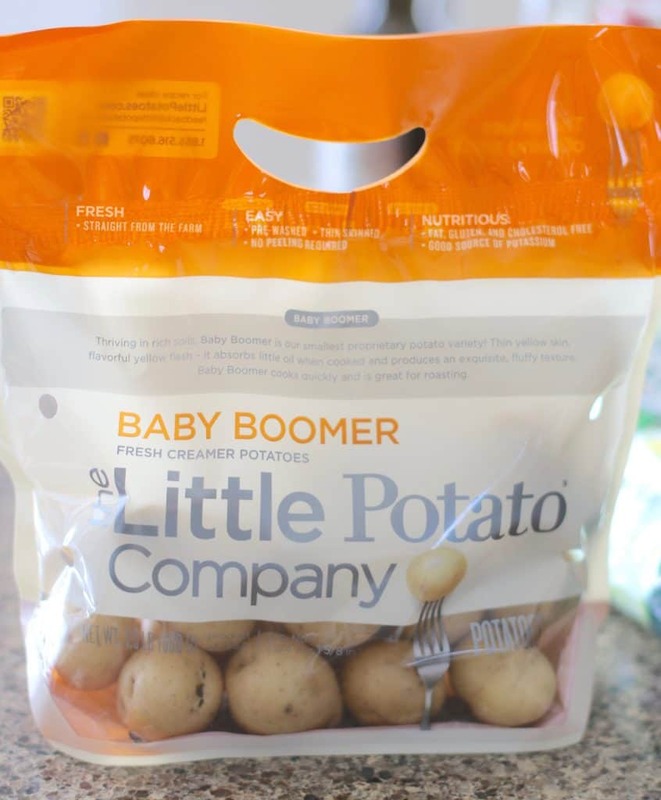 And to add to the ease (and nutrition) of the meal, I am adding in these Baby Boomer creamer potatoes from The Little Potato Company. They already come pre-washed and you don’t need to peel them. How’s that for convenience?! All I do is slice them in half and they hold up really well to the longer cooking process. 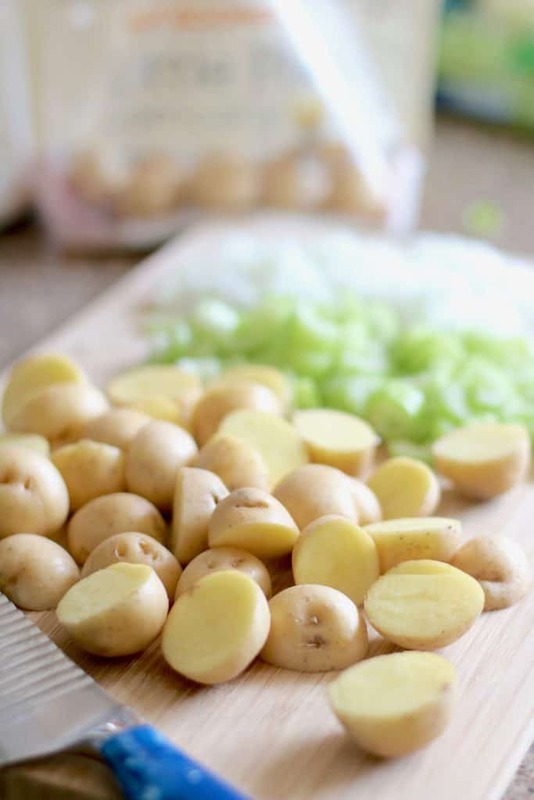 Also, did you know that if you over-salt a soup or a stew that potatoes will help soak up that extra sodium? So, in this dish, you can use a regular beef stock, and the sodium from that beef stock will help season and flavor the potatoes as they soak it all in. 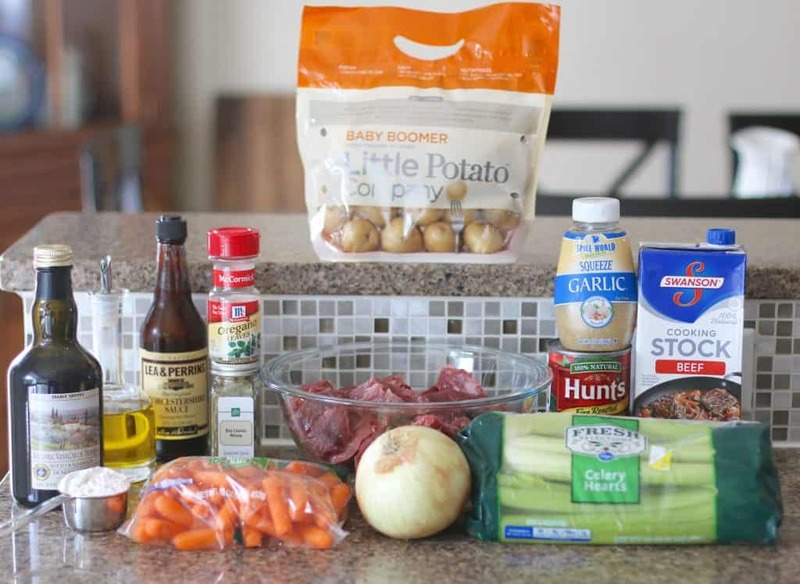 This 1.5 pound bag is the perfect size for this beef stew recipe. 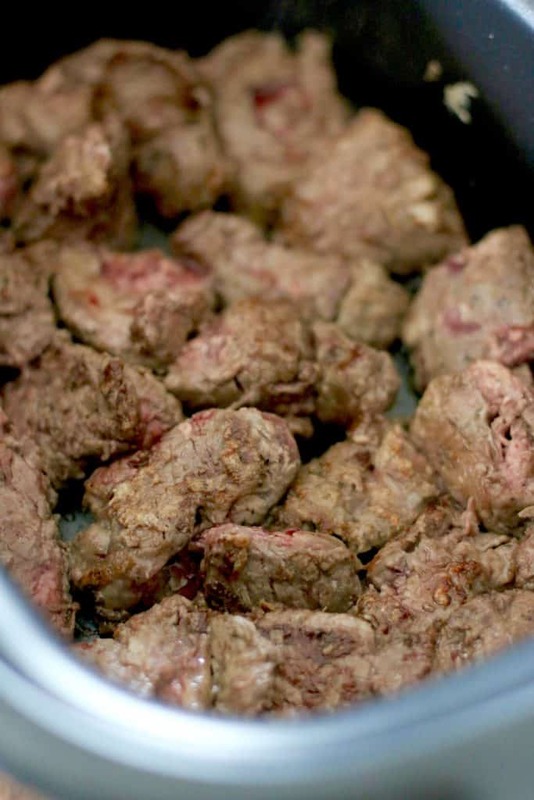 Cook’s Notes: If the stew meat is too large for your liking then cut it up into bite-sized pieces before cooking. 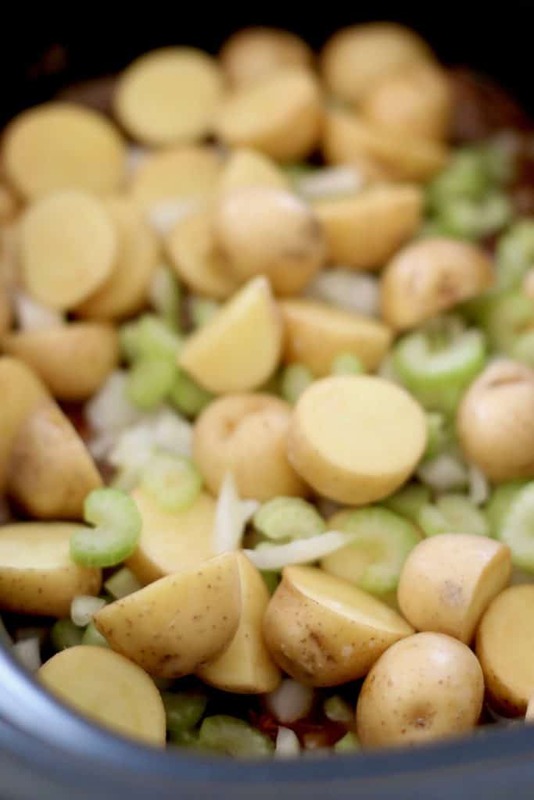 Chop up the celery and onion and slice little potatoes in half. Begin heating up the olive oil in a large skillet. I have a slow cooker that also has a saute setting so that I can brown meat so that’s what I am using here (saves on dishes!) 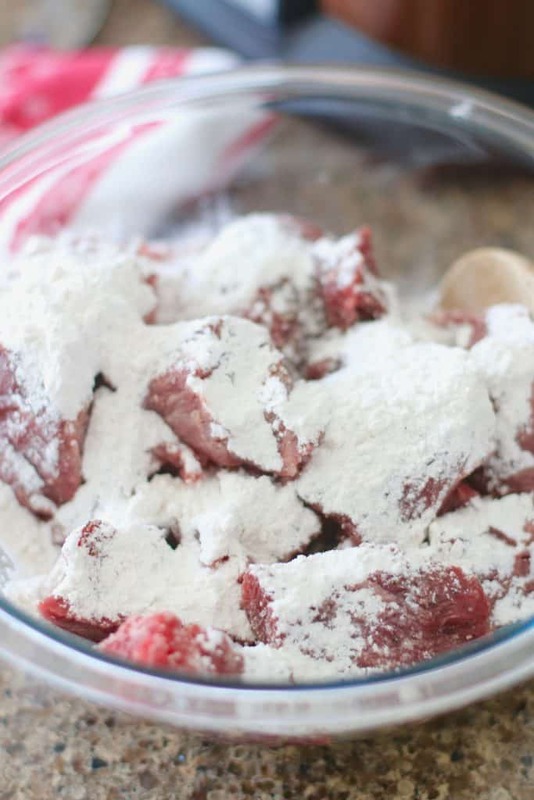 In a bowl, mix together the stew meat with flour, salt and pepper (if using). Once your oil is super hot, add in half of the beef and brown it on both sides. We’re not cooking it through – just browning the outside of the meat. This just gives it a lot of flavor but if you don’t have time for this step, just skip it. Place the first batch of browned beef onto a plate and brown the second batch of beef. 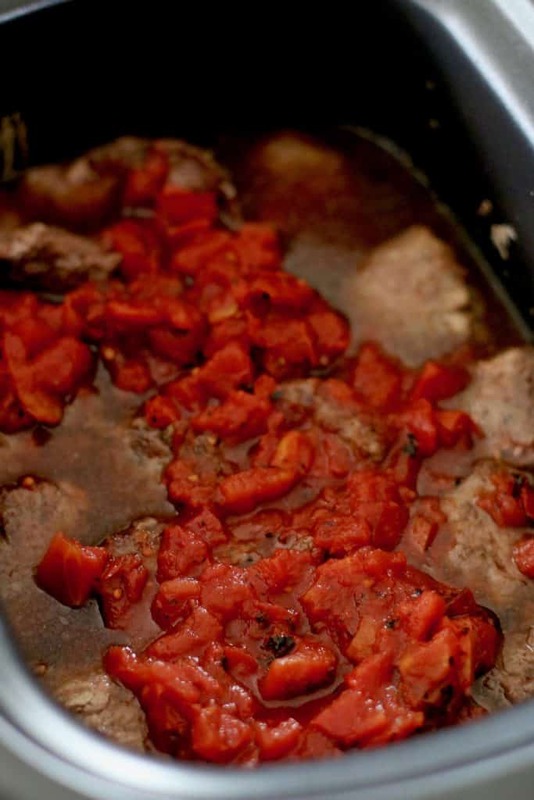 Once all the meat is browned, place it in the bottom of your crockpot then pour in the beef stock, diced tomatoes, Worcestershire sauce & balsamic vinegar and give it all a stir. Then stir in Little Potatoes, celery, onion and carrots. Sprinkle oregano, minced garlic and bay leaf on top. Finally, stir again then cover. Cook on low for 8 hours. Once it’s done cooking, it’s time to thicken it up with a cornstarch slurry. Whisk together cornstarch with cold water or beef broth. Pour mixture into the beef stew and stir well. Then cover and switch to the “high” setting. Let it cook on high for another half an hour to thicken up. Finally, serve it up with some warm, crusty bread for soaking up those juices. Yum! 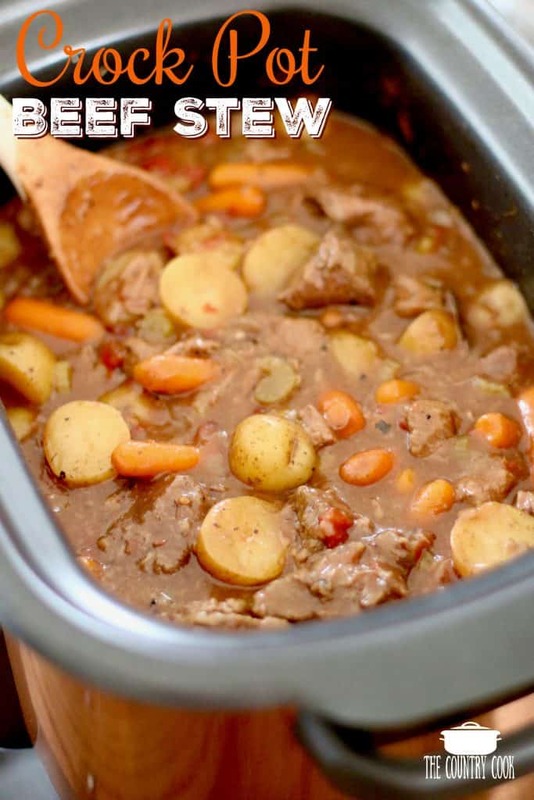 A simple, rib-sticking crock pot beef stew that is perfect for those cold winters! 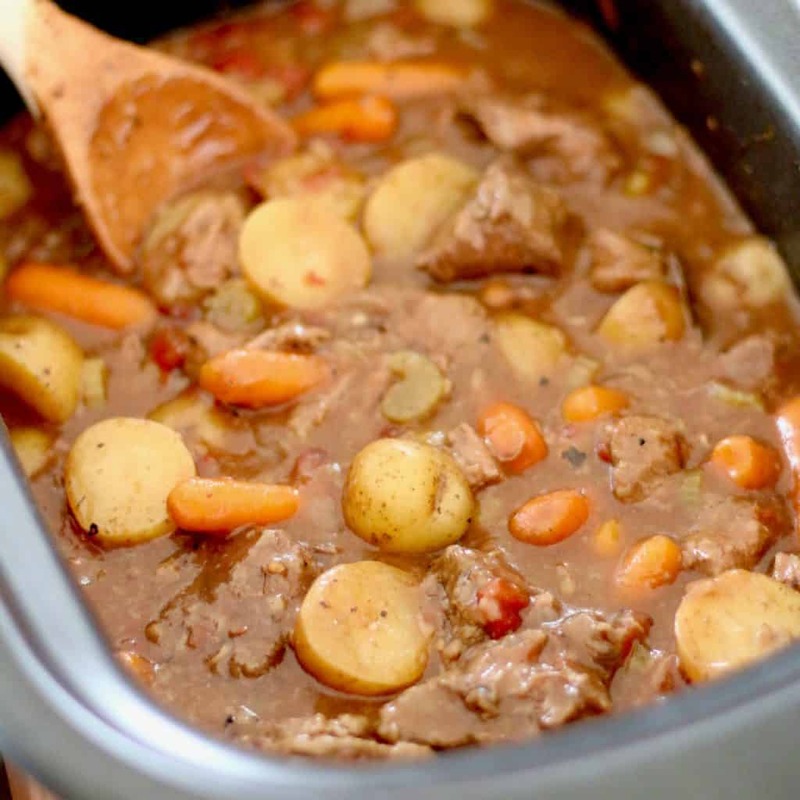 A thick, chunky stew full of beef, potatoes and vegetables! Chop up the celery and onion. 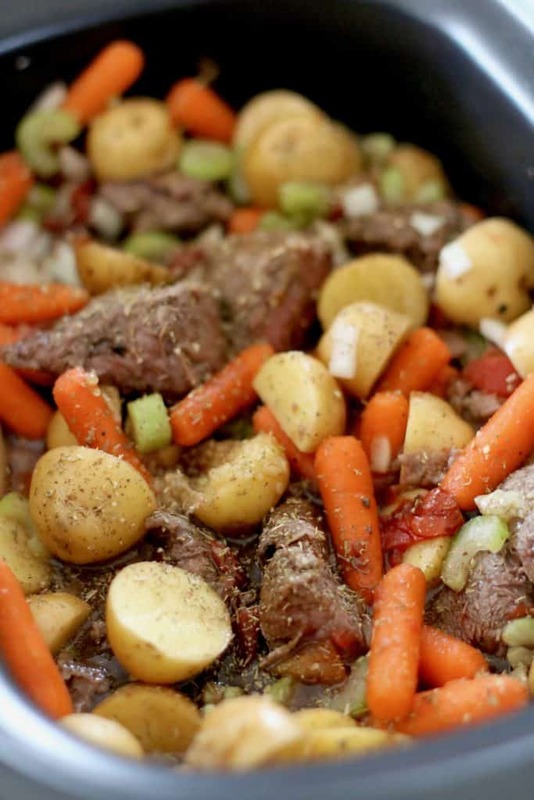 If your beef stew meat is too large in size, then cut it up into more bite­ sized pieces. Begin heating up the olive oil in a large skillet. Once your oil is super hot, add in half of the beef and brown it on both sides. We're not cooking it through ­ just browning the meat. Once all the meat is browned, place it in the bottom of your crock pot. Pour in the beef stock, diced tomatoes, Worcestershire sauce & balsamic vinegar. 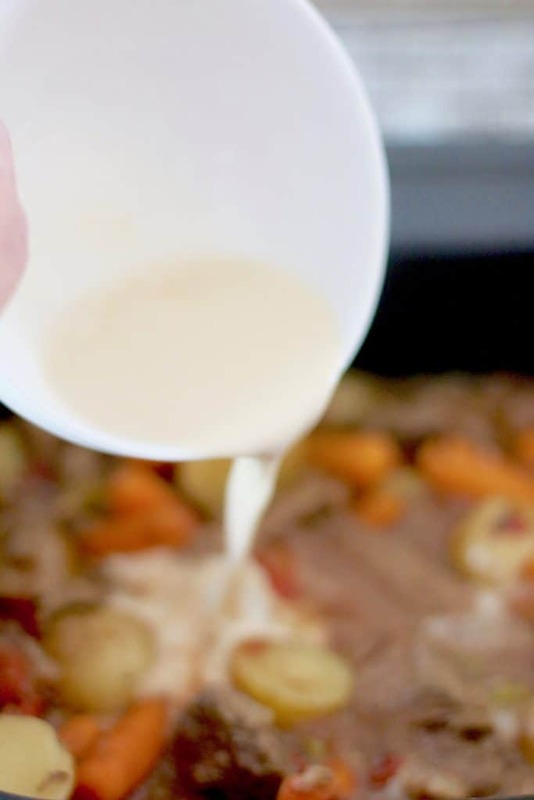 Once it's done cooking, it's time to thicken it up with what is called a cornstarch slurry. 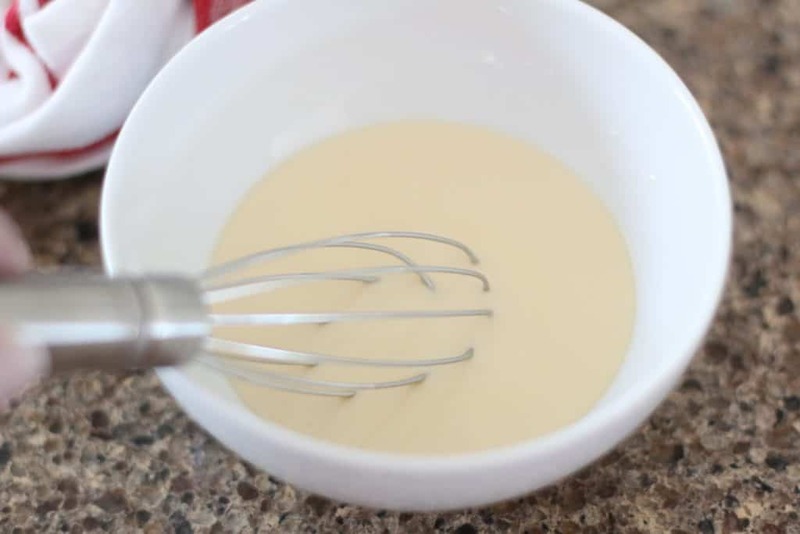 Whisk together cornstarch with cold water or beef broth. Pour mixture into the beef stew and stir well. Cover and switch to the "high" setting. Let it cook on high for another half an hour to thicken up. Want more delicious stew recipes? Try these! I love you recipes and this looks wonderful- thank you for sharing! That makes my day to hear Annie! Thank you and I'm so happy to have you here! I just wanted to add that those crock pot liners work WONDERFULLY well, my hubby does the dishes and he really appreciates them…it is getting cooler out there isn't it, this is perfect!!! LOVE soups and stews.. Sounds yummy and filling! I love soups and stews and am always looking for new recipes. I think I will be trying this recipe this weekend! My husband and I have made several of your recipes and are never disappointed. Keep up the wonderful work! I love your Best Ever Beef Stew and will love this, too! Will my 4 qt. slow cooker be big enough? Thank you! Thank you Jo! I had so many folks after for a slow cooker version so I finally got around to it. Ha! Your 4-quart will work but it will be pretty close to filling up to the top 🙂 Hope that helps! I wish there was a way to easily print your recipes out, am I missing it somewhere? It was right in front of me, so sorry!! Where can I print these from? I am using an iPhone wasn’t sure if that mattered? Hi Tametha! You should see a printer icon towards the bottom of the page. It’s in a recipe card format. Just click on that and then connect to your wifi printer and then you should be able to print it. Hope that helps! This recipe is absolutely perfect just the way it is. I wouldn’t change a thing! I made this last night and it was delicious! The only thing I did differently was I left the onions and celery in 1" chunks rather than dice them. I like really chunky stew. This is a keeper. Thanks! So glad you enjoyed it. I see this getting made a lot in our house this winter. This recipe is in my slow cooker right now. Can you smell it? I'm sure it will be a 5-star hit with my family of five. I'll make a pan of cornbread to go with the stew. We're grandparents raising grandchildren, and we often let the pick a recipe to make. This one will go into the folder of favorites. Thanks for the recipe. This stew looks so hearty! Perfect for fall! Do you have to use corn starch? Hi, the corn starch is for thickning. So you can use flour,arrowroot, or potato starch. You could also use instant potato flakes in some cases to thicken. i know for flour you double the amount. So if yoy were putting 1 tbs of cornstarch youd put 2 tbs of flour. Just keep in mind that flour adds a flavor. Corn starch is often used because you can use less and it is flavorless. All it adds is a glossy coat on top. Will the potatoes get mushy cooking for so long? So you put them in at the beginning? Thanks,,looks great. What if you cant find those potatoes? What do I use instead…what kind and how much? Do I peel the potatoes? Thank you, I would like to try this but dont think my store carries the potatoes! If you are not able to find them, any creamer potatoes will work. You do not have to peel them. Hope you get to try this one soon. We went camping this weekend, this weather was cool and absolutely wonderful! I put this on Saturday morning and cooked it all day and made a pan of cornbread that night. It was wonderful!!!!!! This recipe will stay in my camper. I’m always looking for new stew recipes and this one looks worth giving a try. Thanks for sharing. 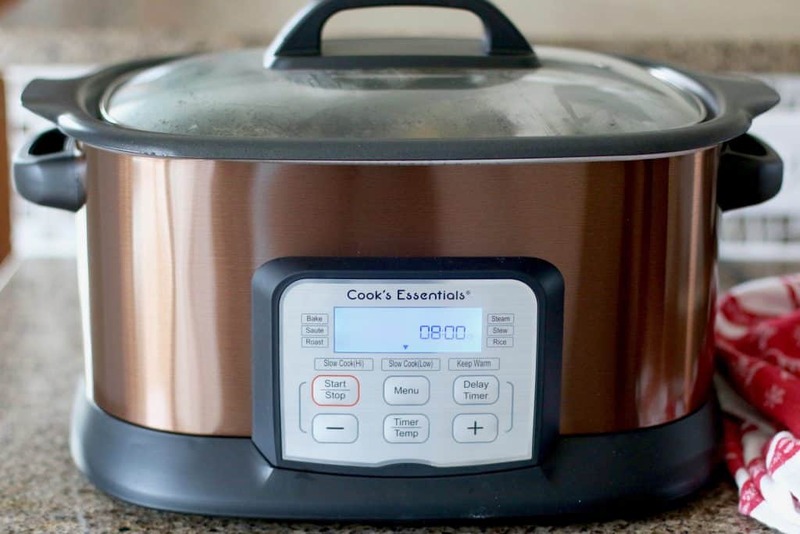 Where can I find this slow cooker? Thanks! You list beef broth and beef stock in the recipe. Which did you use? Hi…your recipe says it serves 6-8, but it doesn’t say how big a serving size is….any idea? Hi Taumi – well, that is always hard to figure because some folks will take a larger serving than others but I would guess roughly about 1 1/2 cups. Hope that helps! Hi do you have to brown the beef first or can it go in the slow cooker as is? I just fixed the beef & potato stew at a hunting camp and they loved it. Thank you for the recipe. The video shows you coating the meat with cornstarch before browning, however the recipe says flour. Will either work, or is one better than another? Looks super yummy, and I’m anxious for the weather to turn cold so we can have this!! Can I cook this faster, or on a higher temp? Would it come out ok without the tomatoes? Not a big fan of them.